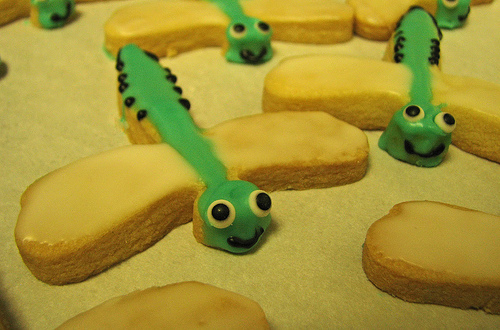 People have asked me for this butter cookie recipe so many times that I thought I better add it to the blog. You can use any kind of cookie cutter you want. For bite sized cookies I've used the floral shaped cutteres used by sushi chefs for garnish making. People especially like the bite sized cookies, which are perfect for parties. Two quick tips: Make sure your butter is softened and dip your cookie cutter into some flour so it doesn't stick to the dough. Yield: 30 medium sized cookies or around 60 + bite sized morsels. Preheat oven to 300 degrees. Cream butter and sugar together until pale yellow then add vanilla. Gently mix in flour. Let the dough rest for 5 minutes. Gather the dough together and press into a ball with the warmth of your hands. Roll out on a clean, floured surface into a ¼ inch thickness. 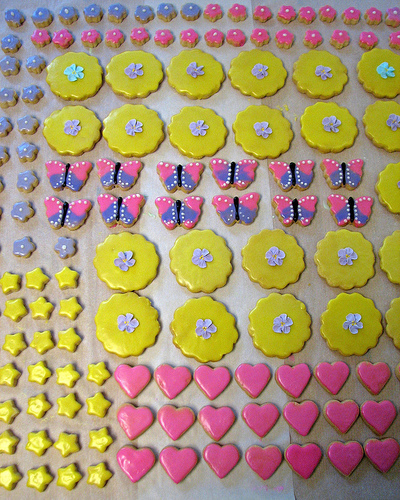 Cut into shapes with cookie cutters then place on a sheet tray lined with parchment paper. Leave ½ inch between each cookie. Bake at 300 degrees for 15 minutes then turn temperature up to 350 degrees for 5 to 10 minutes or until they begin to turn golden brown in color. Once cool ice with a layer of the icing recipe which follows. 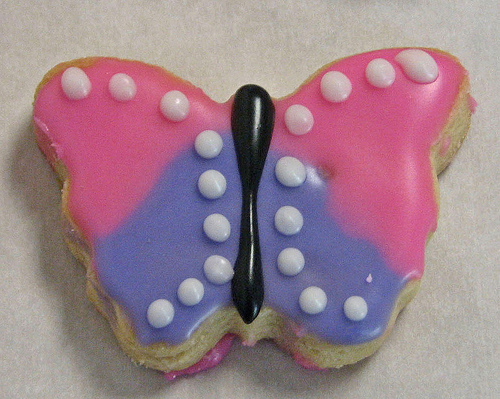 This entry was posted in Uncategorized and tagged baking, bite sized cookies, butter cookies, butterflies, chef@isimmer, cookie cutters, cooking, dragonfly cookies, food, heart shaped cookies, iced cookies, isimmer.com, stars, sugar and spice. Bookmark the permalink. woooo hooo!These are the best cookies ever! I served them at a baby shower and people couldn't stop eating them.Thanks so much for sharing this Susan!